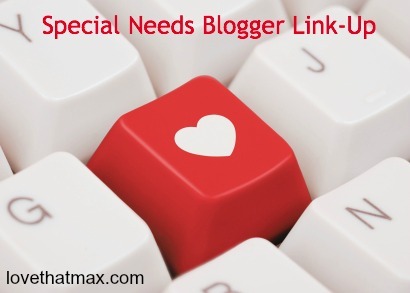 It's another Special Needs Blogger Weekend Link-Up, and this one's an end-of-year special. Share your favorite post of 2013! OK, because it's hard to choose just one, share two. And if it's really, really impossible to pick two, share three. It will come as no surprise that the two posts I linked are about communication and providing children with complex communication needs with an alternative means of "talking" :) My "Open Letter" post is a how-do-I-even-begin post, and the "I am not a mindreader" post is for the families who are waiting to look into AAC because "even though she can't talk we understand everything she's trying to say." Thank you for this, Ellen... Not just today, but each week. For bringing together so many people in such a safe and supportive space. You have truly created a network - a net - for all of us. Happy, healthy New Year! Today I want to thank you for providing the opportunity to connect here each week. I have met so many awesome bloggers through your link-up. Thank you so much for connecting the dots across the SN blogospere! Just one question why today instead of tomorrow? Is there a reason for that? Never mind and I hope you have a good 2014. Ellen, I appreciate that you do this as I have found so many wonderful blogs to read & follow. I only hope that what I share is meaningful to others, as well. I shared a new post that is practical, but also a favorite of the year, Inclusion is NOT a program. Wishing all of you a wonderful New Year! Thank you for the opportunity to share. I am actually sharing a post from this week about how my son refused to perform for his Christmas show. I did learn a meaningful lesson though. We took the Greyhound bus this holiday season. My thirteen year old son ended up being part of a mini Christmas miracle. It was pretty awesome!!! Thanks again for hosting this, Ellen. Hugs!! !